This was one of the first sentences I heard from Ralfonso and the one that still echoes in my mind. 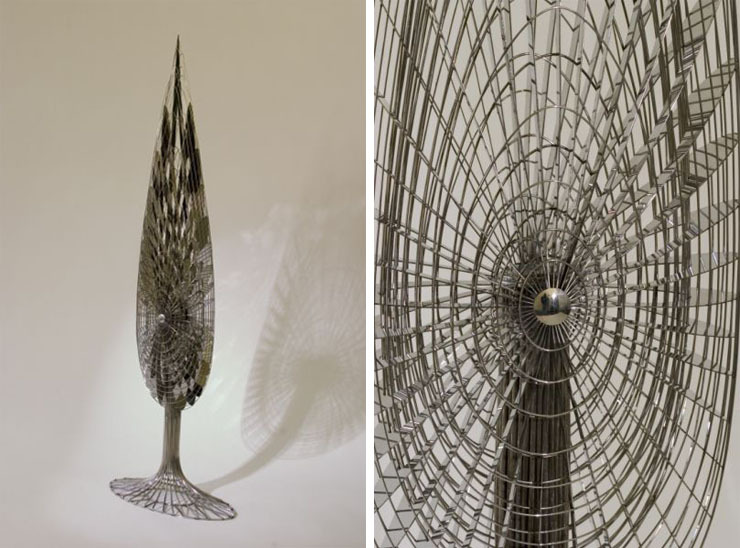 The Swiss contemporary artist who specializes in a rather rare form of expression – kinetic sculpture, does not hide his happiness when talking about his career, but after discovering more about his work, I cannot stop and wonder – was it really all luck? The answer is no, it wasn’t. It took a great deal of courage, decisiveness to break-up with a successful business career and to pursue an almost surreal dream. An innate optimism, hard work, endless imagination and kindness are key ingredients to Ralfonso’s success, while luck is there as a seasoning, giving his life as an artist a specific aroma. 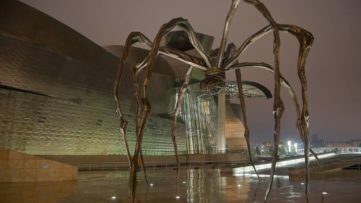 Following the footsteps of Calder and Tinguely, Ralfonso became one of the most sought-after public artists in China today, while his kinetic forms have also found the way into the American and European scene. 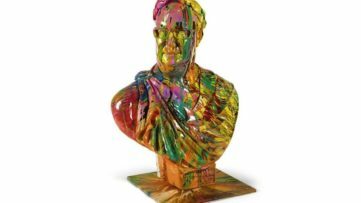 Even though we cannot see the movement forming yet, the artist claims it’s almost here, as he delves into new endeavors, one of them being a Sotheby’s auction entitled Contemporary Curated, scheduled for March 3 at Sotheby’s in New York, where Ralfonso will take part with a small version of his famous piece. In a dynamic conversation with Ralfonso, I’ve learned about his past, his adventures and his art. He was generous enough to tell some of his favorite episodes, which left me, and I trust will leave our readers, utterly inspired. “I studied undergraduate and graduate business MBA in finance and an MBA in real estate. So yes, my background is business, and part of my life certainly was in the business world, and still is I guess. 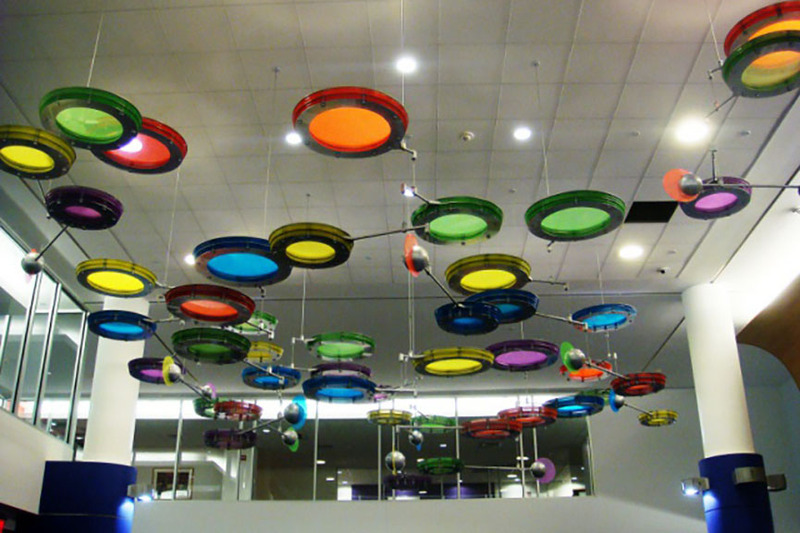 But, I always wanted to, finally, when I had enough funds and enough time; create art, specifically kinetic art. And so, 15 years ago, I finally was at that point where there were sufficient time and funds to begin my career as a kinetic artist”, Ralfonso tells. 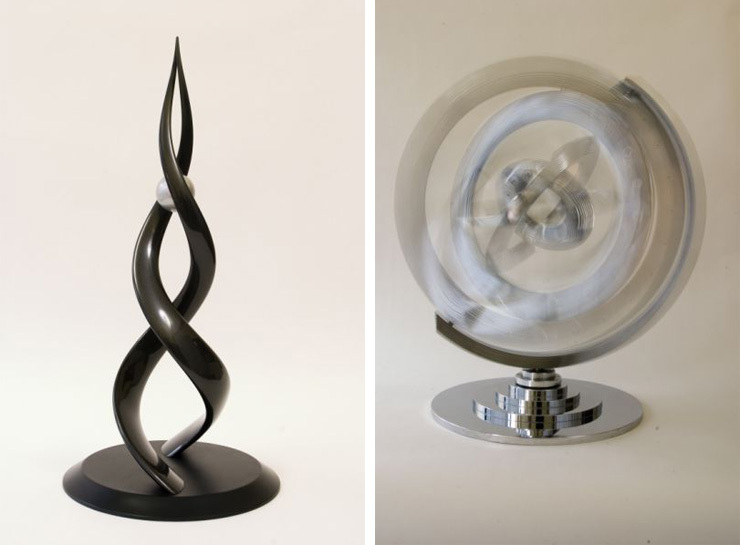 Still, the idea of engaging in kinetic art came from a childhood fascination and a passion for design and aesthetics. As a little kid I’ve always been fascinated by mechanisms, by machines – anything that had gears, like any young boy, I guess. Although, for me there was a passion early on to take things apart, much to the dismay of my mother, who always said I couldn’t’ quite put them back together the way they were. But I didn’t really need to do it either. In addition, I have a passion for design; good design, clean design and maybe even science a little bit, and at the intersection of all my interests we find that sweet spot called kinetic and interactive art, so I very naturally came to this expression. Inspired by Calder and Rickey’s cleanly devised sculptures, Ralfonso embarked on this journey, in which the inspiration comes in different ways. However, some engineering knowledge appears to be necessary when creating a kinetic sculpture. One learns on the go, claims the artist, dictated by nothing else but the concept of the artwork, including its natural running force. Not to mention that by generating energy, these pieces are completely green. 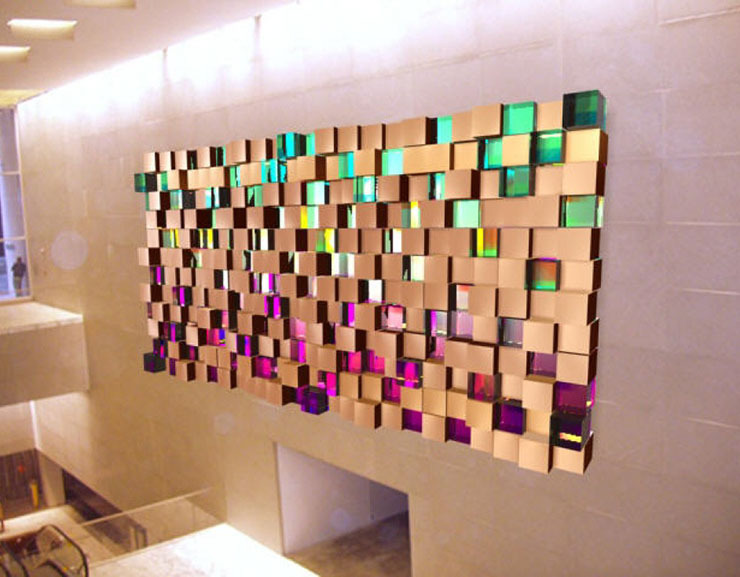 In his interactive work, he does require the assistance of the experts still, since these installations function via the internet, remotely or are put in motion by sensors detecting sound, proximity, movement or even a smartphone app! 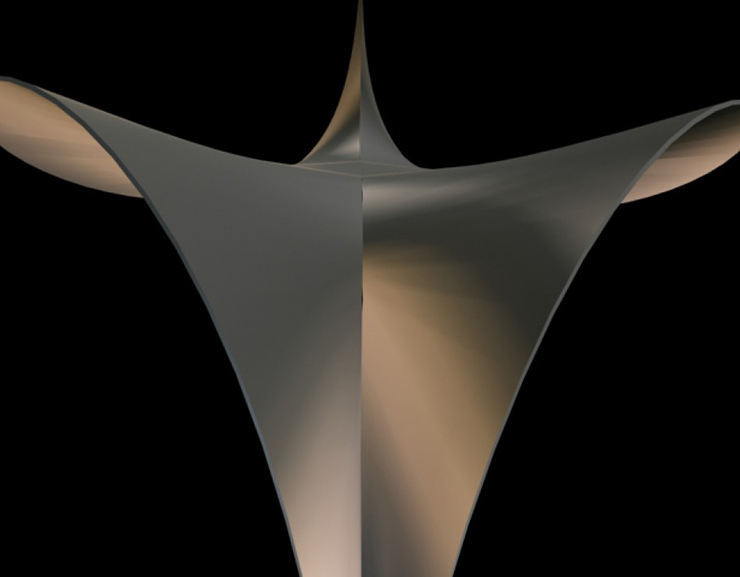 The behavior of such sculptures in motion is predictable, subject to design, but especially the sensation Ralfonso wants to awaken, especially in the youngest members of his vast audience. 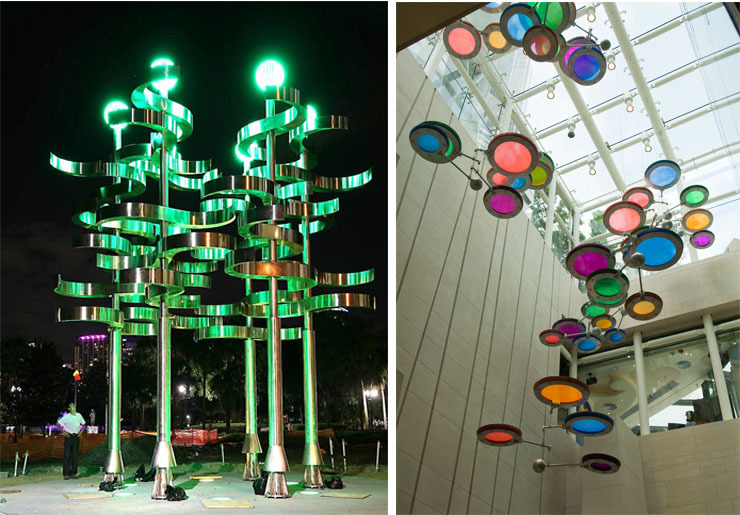 Curiously, Ralfonso is an artist whose work was largely commissioned during the first 15 active years of his course. He has been working on numerous large and monumental pieces around the globe, accidentally walking the opposite than the usual small-to-big-scale path. The first artwork he has ever made was the 5 meters high Moving on Up in St. Petersburg, Russia. And its commission and inauguration the artist still remembers fondly, happy to recount the anecdote. 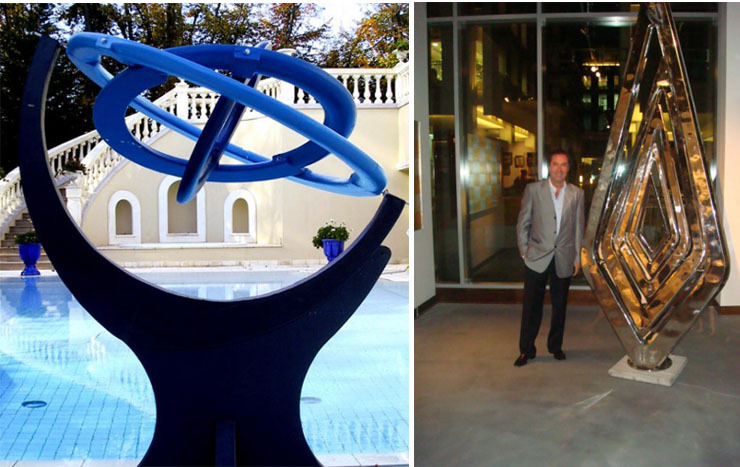 The somewhat odd first contact resulted in the successful commission and an exhibition at the Kempinski Grand Hotel. Thanking his lucky stars, the fresh sculptor was asked to give an interview in front of a large crowd and had to agree, despite the slight aphonia. Thirty to forty journalists and photographers greeted Ralfonso, to his amazement, but the story ends rather well. Interestingly, the vast coverage and the warm welcome Ralfonso had the luck of experiencing in Russia never brought him back to this country. He was destined to go elsewhere – further east. Bold choices, as well as a spectacular outburst of hidden talent, have marked this businessman-turned-artist’s road and given him the role of a pioneer in his newfound area. 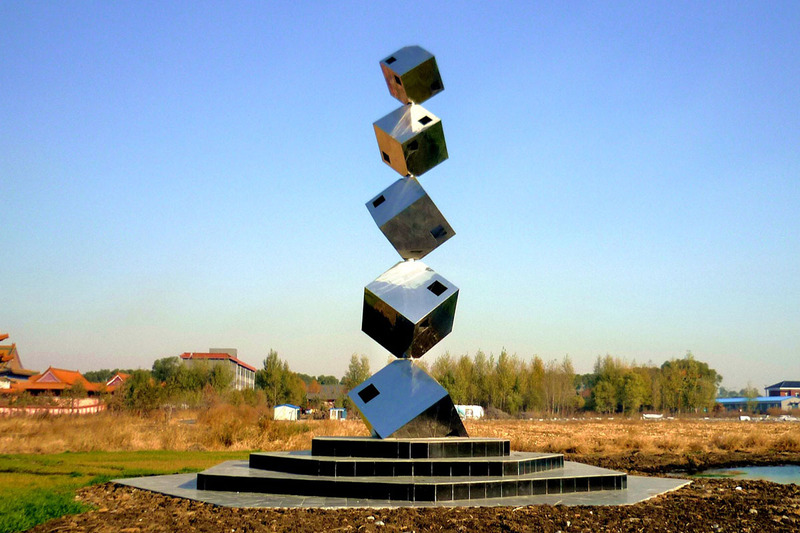 Back in 2004, Ralfonso found himself in China as the founder of Kinetic Art Organization, also known as KAO. 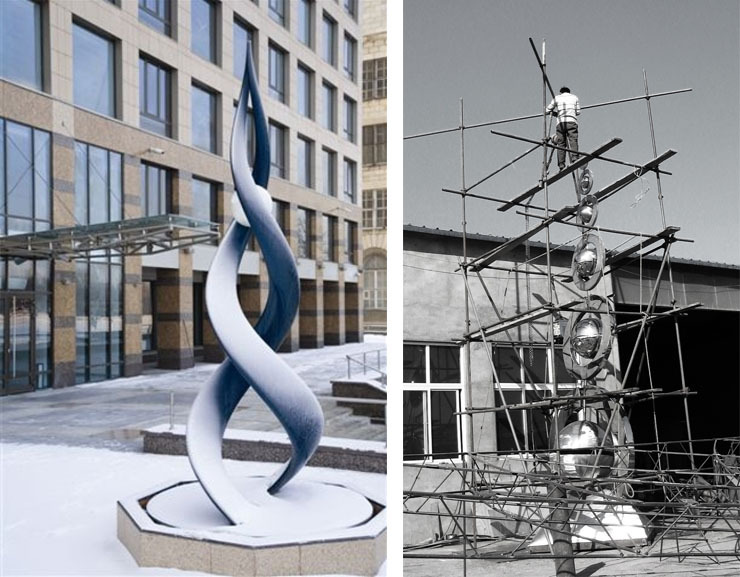 Having introduced the contemporary kinetic art into the Chinese public sphere as well as the market along with a colleague professor from Beijing, he soon became a recognized name in the country. 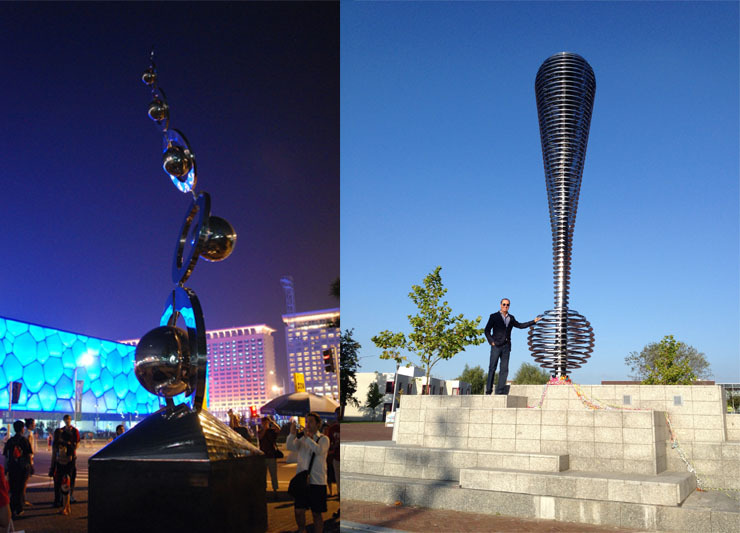 The China Sculpture Institute from Beijing commissioned his sculpture Dance with the Wind for the Olympic Park of 2008, having listed Ralf Gschwend as one of the most accomplished kinetic artists of the day. 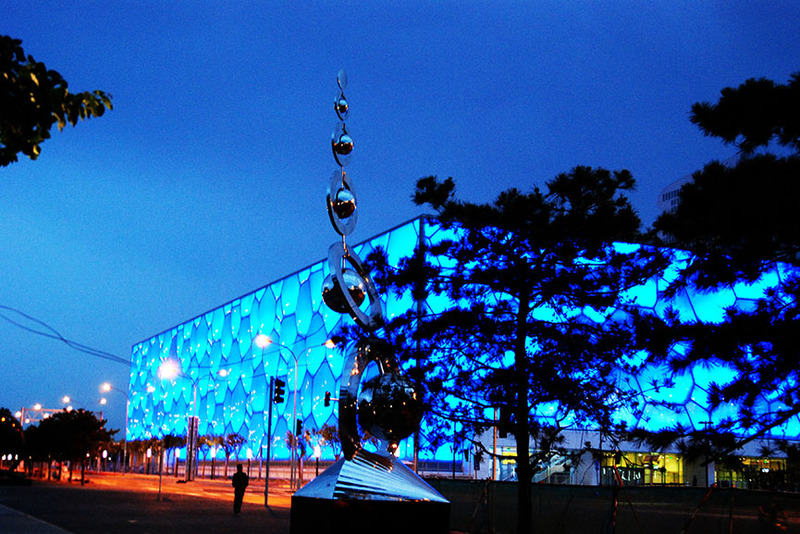 The piece is situated in between the “Bird’s Nest” and the “Ice Cube”, on what was then the swimming pavilion. Finally, he was asked to teach an intensive graduate course to a group of students at the Tsinghua University, one of the most respected education institutions in China. Even though his work stirred up some spirit in Beijing, Ralfonso did not stay a teacher. The experience of interacting with eager students is something to cherish, he’s rather an artist than a professor, as he says. Comparing the Western and the Eastern world the difference springs as something natural. The art markets are something Ralfonso admits is new to him, since he was working as a public artist, with commissioned works only, from the very beginning. 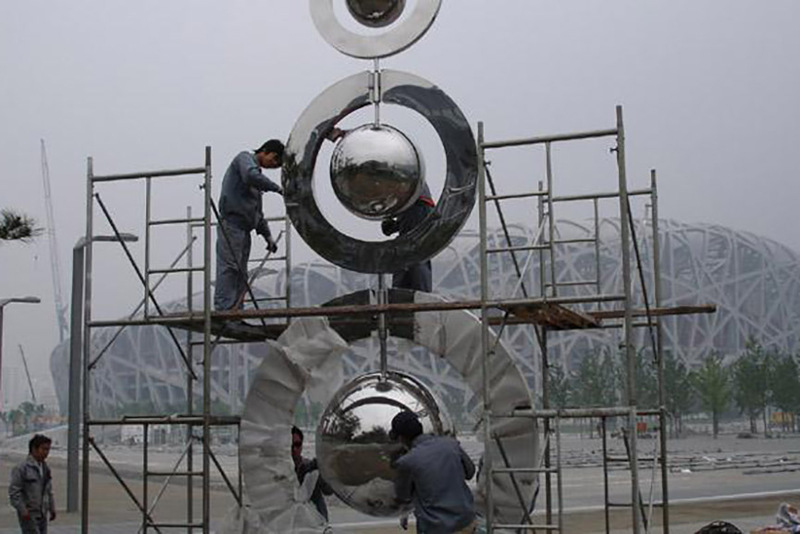 Fast expansion of Chinese cities proved a fertile ground for public art and a welcome environment for kinetic sculpture, but in the western world – public needs are not the same and kinetic art is not as popular. Nevertheless, things have been shifting slightly, according to Ralfonso. Asking the artist what would be the next step in this novel kinetic art development, I got the answer – an explosion. And we are to thank smartphones, iPads and other gadgets and technology we can no longer live without. Superficiality might be taking its toll on the intellectual aspects of living at first, but the innate need for researching the depth can come back via wi-fi and selfies. Exciting the observers superficially, the young people especially, there is a chance of penetrating their inner minds and emotions, as the new generations are naturally more responsive to technology. 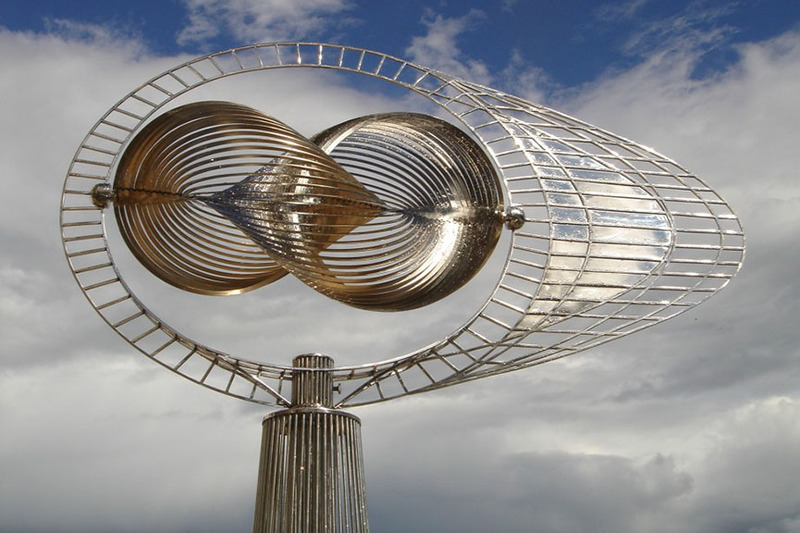 Kinetic art, Ralfonso claims, must follow the times, hoping to instigate contemplation and catharsis. Inspiration never seems to leave Ralfonso, since he is now turning to work on the smaller scale. The reverse nature of his career does not discourage him in any way since the artist looks forward to entering the familiar gallery and auction market. 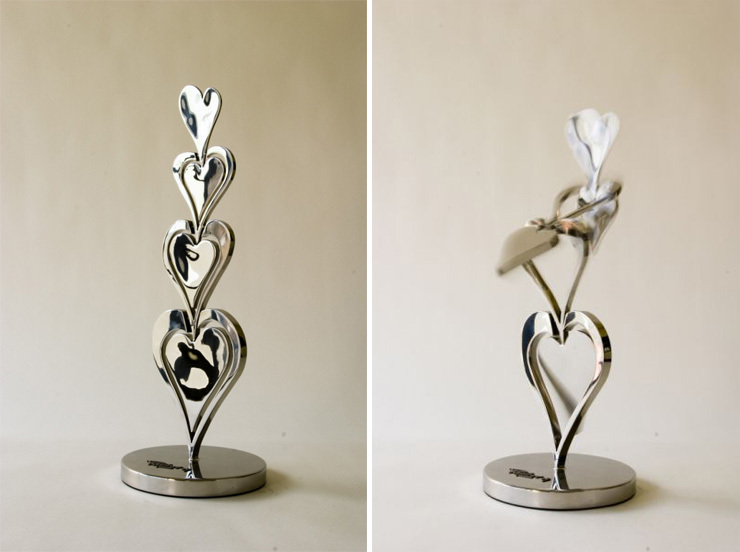 The change of scale brought the advancement in expression, allowing the non-kinetic works into the sculptor’s oeuvre. 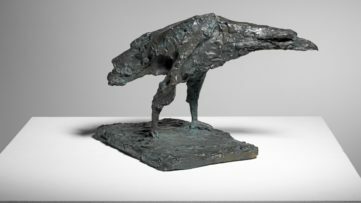 Starting with the Sotheby’s auction, it’s hard to imagine anything but the collectors’ frenzy after smaller sculptures by Ralfonso enters the scene. 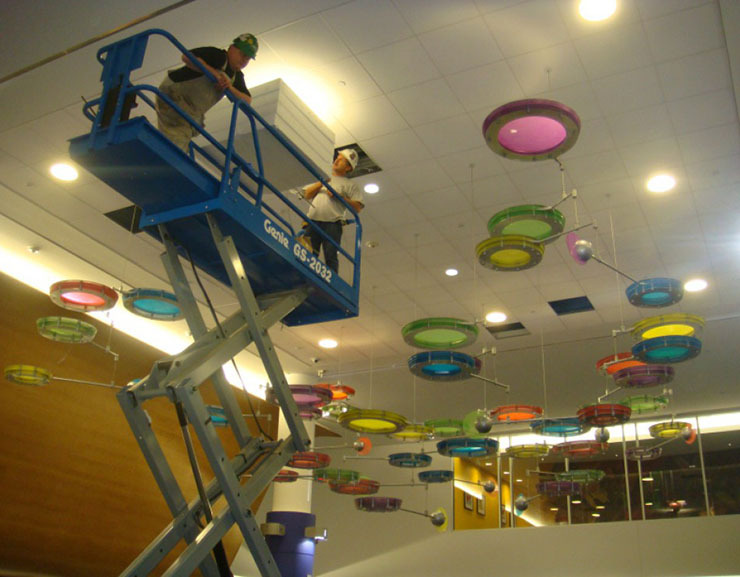 Besides the Contemporary Curated auction, Ralfonso’s plans for 2016 include an exhibition and a lecture in Palm Bay, Florida organized in connection with the Art, Architecture & Sustainability symposium, meeting the gallerist of his career while breathing the life into more bright, animated creations. Concluding our lengthy conversation, I got an insight into something more than a history of Ralfonso’s endeavors in another anecdote this inspiring creator told me. Speaking about one of his lectures in China, where the students preferred to write their questions to him on pieces of paper, rather than occupying their colleagues’ time with their own inquiries, one of the questions the artist still remembers, since it was different from anything he had encountered in the West before. “Where is the Soul in your sculpture?” a Chinese student asked, thus bewildering the sculptor. 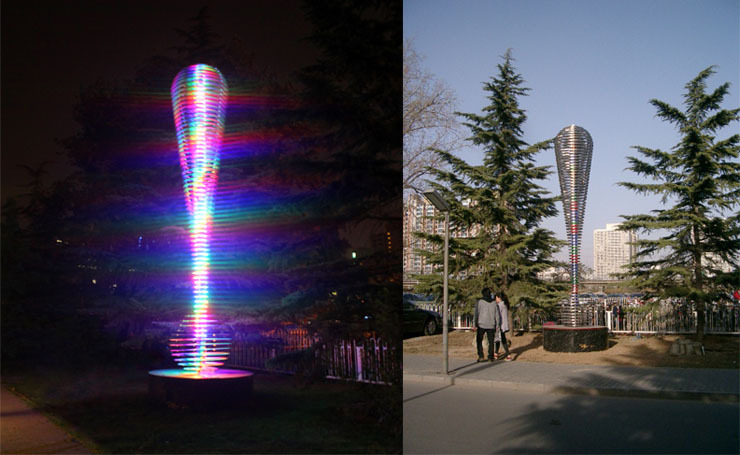 Featured images in slider: Qube Tower, Changchun; Ad Infinitum, Zhengzhou, Henan, China; Installation at Beijing Olympics 2008; Dance with the Wind Kinetic Sculpture at 2008 Beijing Olympics in front of Ice Cube Swimming Stadium; ExoCentric Spirits#3, Pittsburgh, Children’s Hospital; Bird of Paradise. All images courtesy of Ralfonso.